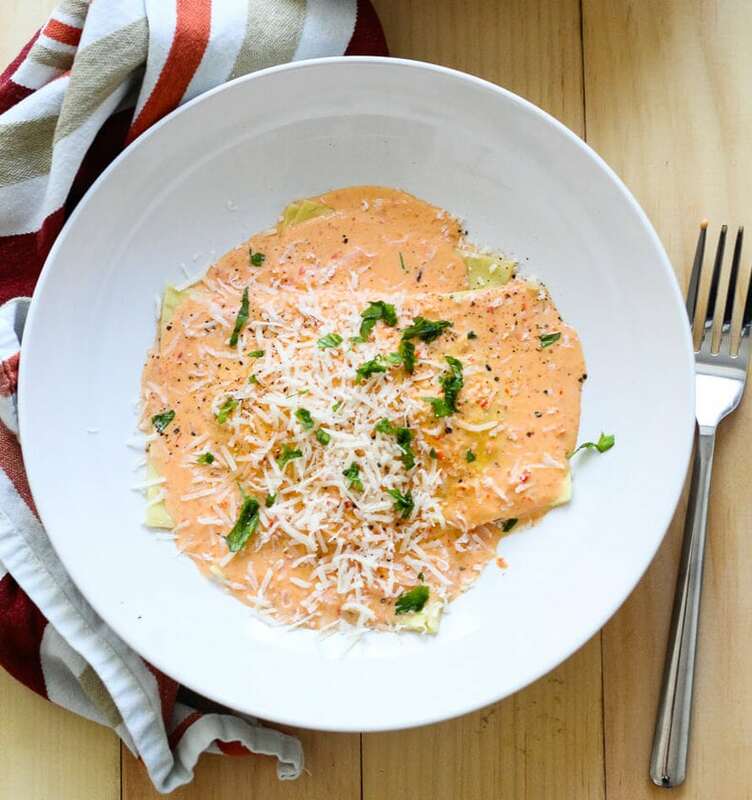 Butternut Squash Ravioli with a roasted red pepper alfredo cream sauce – all you need are some fresh lasagne sheets for easy homemade ravioli in seconds! Delicious, rich pasta in cream sauce. Now that is how to end a Monday! 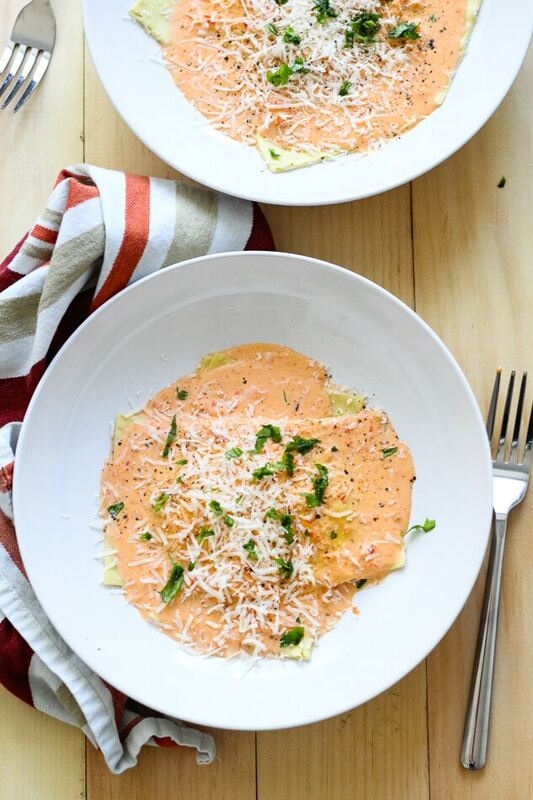 This may not be the easiest or quickest recipe, or the healthiest, but if you're like me and thrive in the kitchen, then you have to try this Butternut Squash Ravioli and its delectably luxurious Roasted Red Pepper Cream Sauce. Your tastebuds will thank you. I love squash at this time of the year. I'm not loving how dark it gets at night, and crave comfort food even more than usual. I personally also get and extra healthy craving for all kinds of seasonal vegetables, and I would have to say that fall is one of my favourite times of the year for seasonal produce. 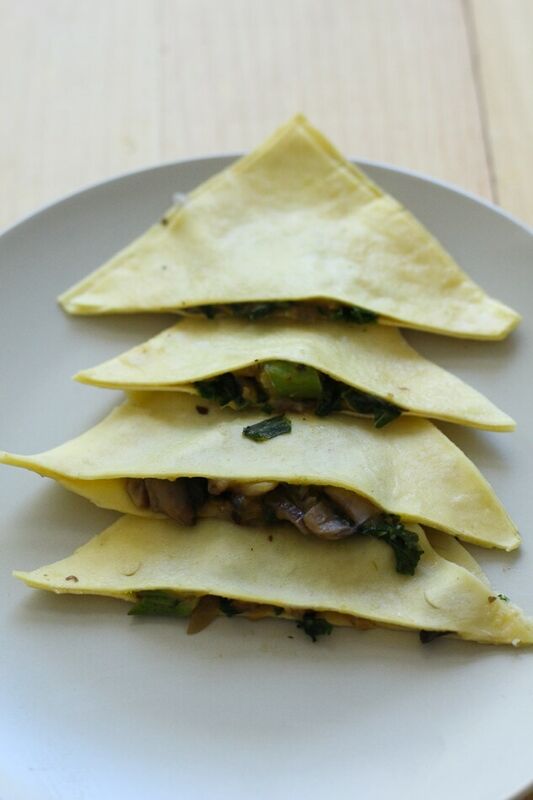 Squash, mushrooms, root vegetables and kale are just some of my favourites, and I've tried to incorporate them all in the ravioli mix. Making the ravioli itself was kind of tricky, but it was fairly easy to make using store bought fresh lasagne sheets. I got some tips and tricks from this handy Youtube tutorial. The only notes I would add is that I found it helpful to use a floured surface, and also use the flour itself to make the the sheets stick together with a bit of extra water. I also found that you have to get the lasagne sheets really wet and pliable with hot water, running them under the tap for about 20-30 seconds until you can mold them and they become stickier. After a few hiccups and some practice I got the hang of it! Also, be sure to leave your lasagne sheets in the fridge until you need them so they don't dry out. 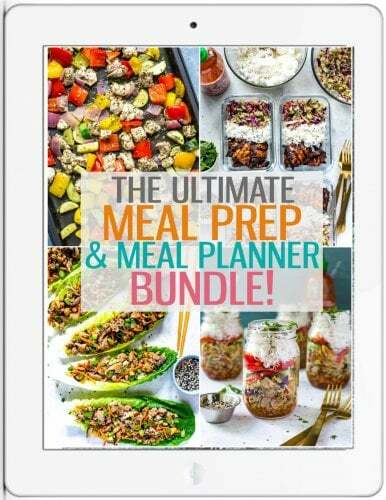 This may not be the healthiest recipe, but at least you'll get all your veggies in with this delicious filling. 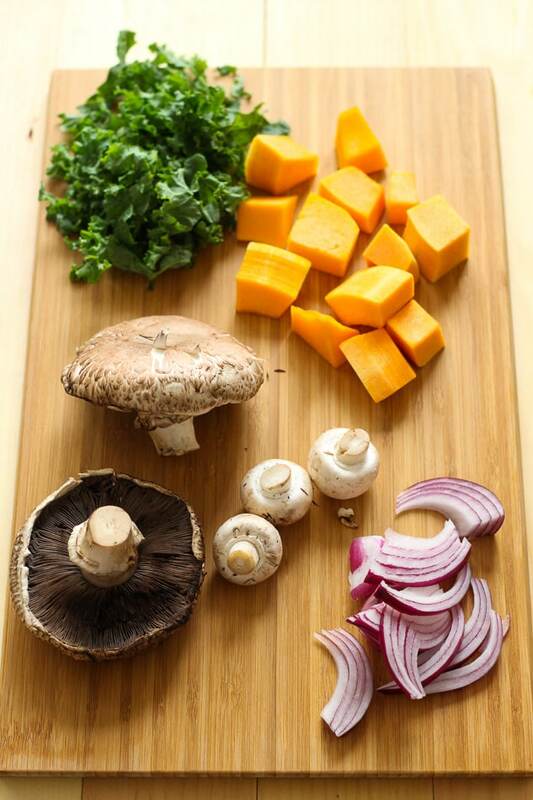 A mixture of butternut squash puree, three different types of mushrooms, red onion and kale…what could be more delicious? I had some leftover filling that I am currently keeping in the fridge to use for another dinner this week. 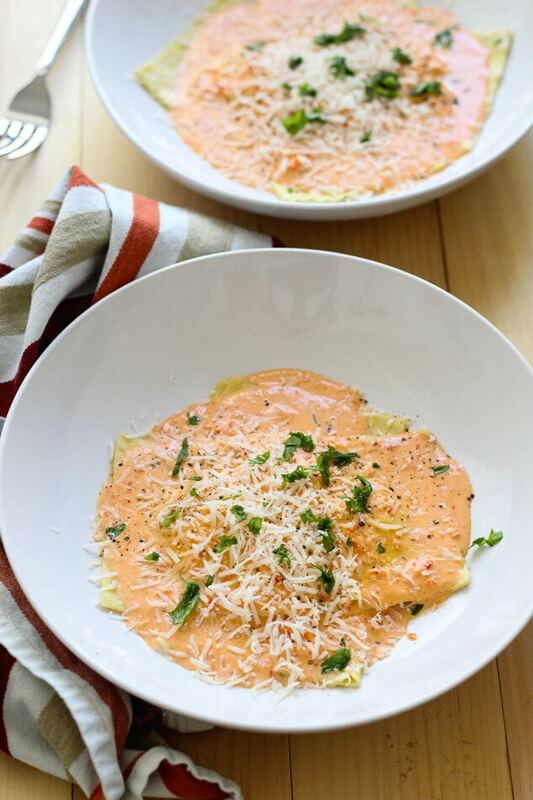 Will you be trying this Butternut Squash Ravioli or my Red Pepper Cream Sauce? This Butternut Squash Ravioli is served in a luxuriously delectable Red Pepper Cream Sauce for the perfect Meatless Monday! Preheat oven to 425 degrees. Slice peppers in half, getting rid of seeds and white pith. Drizzle with about 1 tbsp of olive oil, then cook in oven for 30 min. While peppers are cooking, begin the filling, saving the cream sauce until last. Cut butternut squash into pieces and sauté with olive oil for 2 min. Add broth and cook on medium heat until squash is tender, about 10 min. Put squash into blender or Magic Bullet to puree, then pour into large mixing bowl. In a medium sized frying pan, add olive oil til pan is heated. Add red onion, shallots, garlic and cook for 1 min. 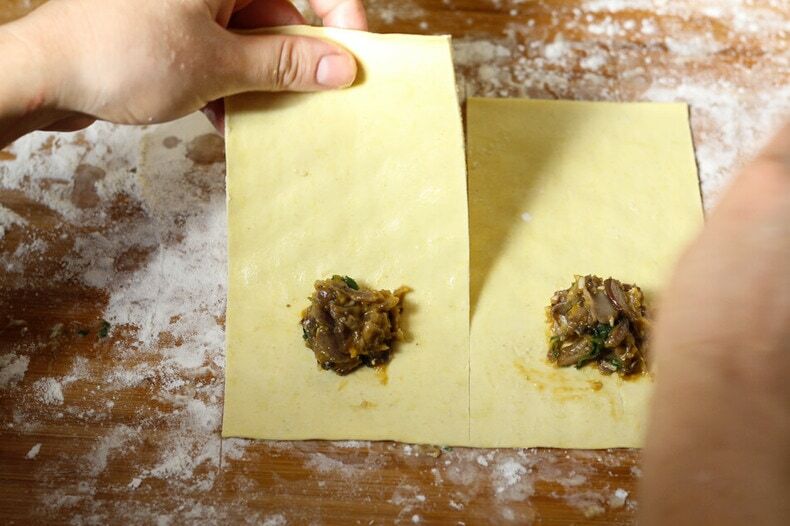 Add mushrooms and cook until they release juices, about 5-6 min. Add wine, salt and pepper and cook for another 2 min. Add kale and stir, removing from heat. Add mushroom mixture to butternut squash puree, then add lemon juice, parmesan cheese and basil. 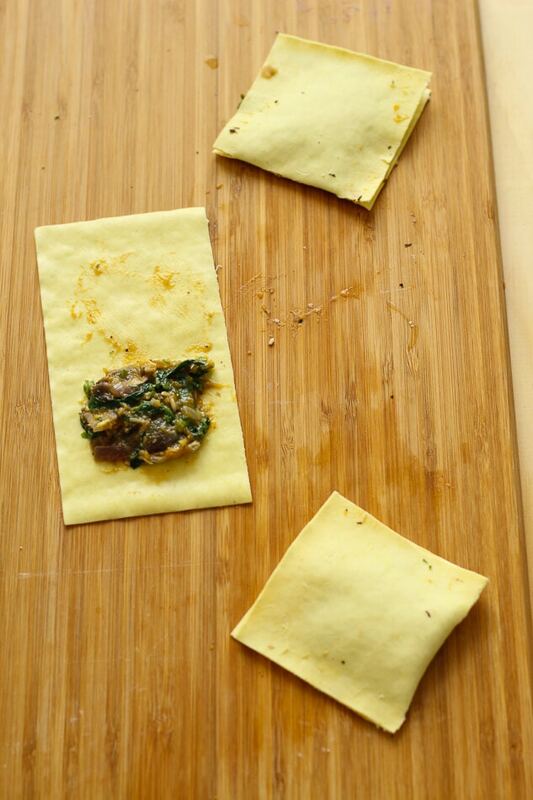 Run lasagne sheets under hot water one at a time for 20-30 seconds until pliable. Place wet sheet on a floured surface. Add about 1 tsp of filling to lasagne sheet, and sprinkle some flour on the wet lasagne sheet to make it sticky. Cut sheet in three, and then fold each segment over and press down to get rid of air bubbles where filling is. Use a fork if necessary to press pasta down to stick. 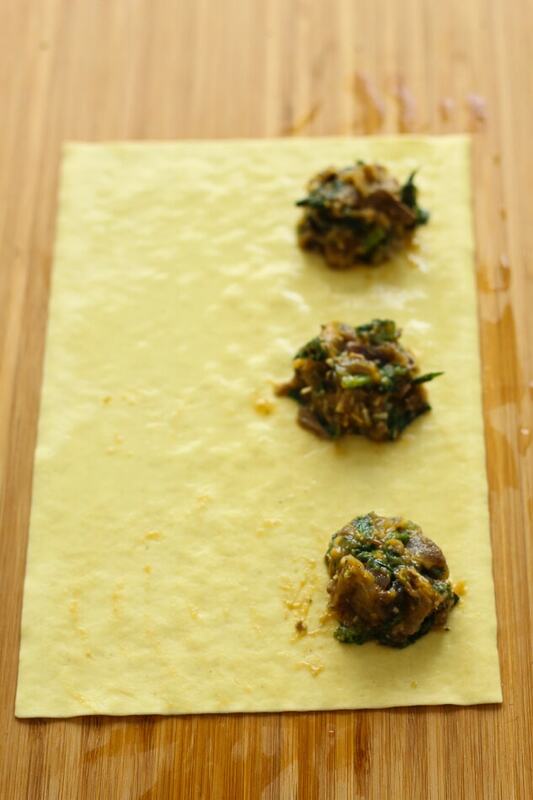 Once you have all your raviolis (we recommend about 4-5 raviolis per person, they are pretty big! ), drop them each delicately into a large pot of boiling water and cook for about 1min 30 seconds until ravioli floats to the top and the pasta is al dente. 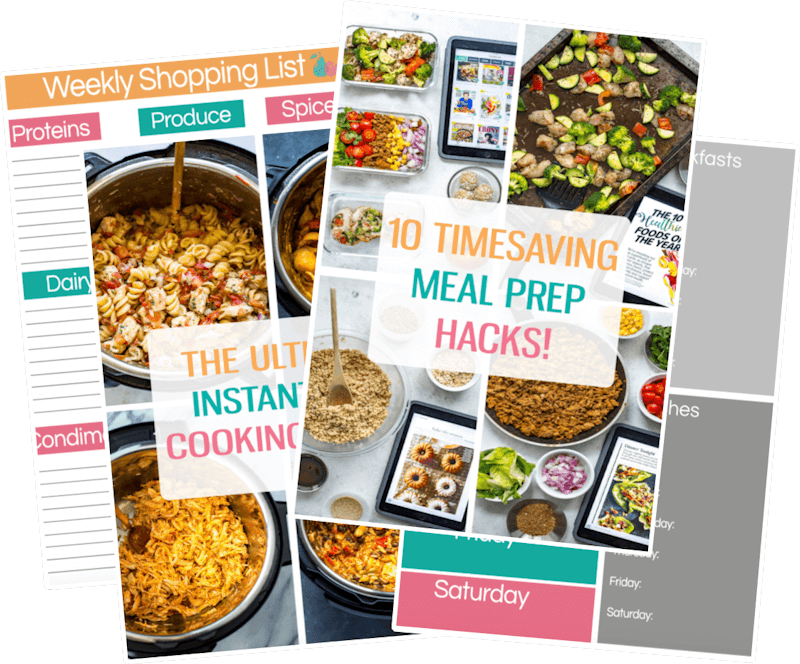 It shouldn't take long because you have already ran the pasta until hot water and partially cooked it, plus fresh pasta takes way less time to cook. 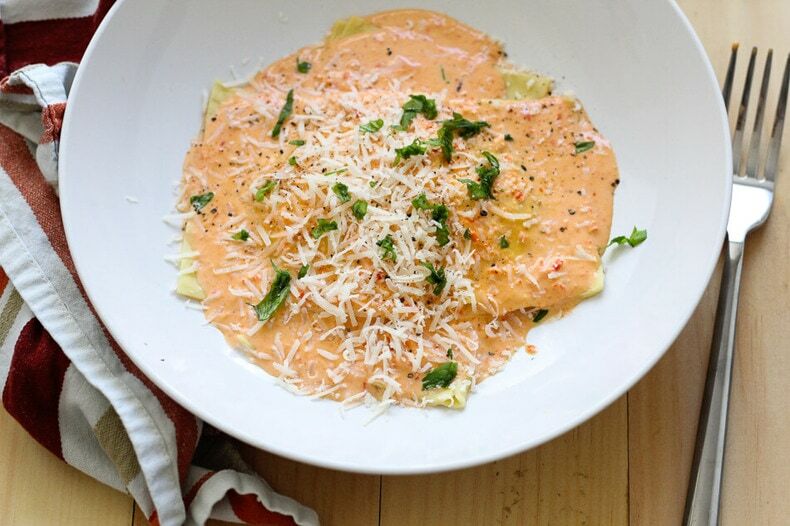 Serve ravioli with red pepper cream sauce, and garnish with parmesan cheese, fresh basil and salt & pepper. 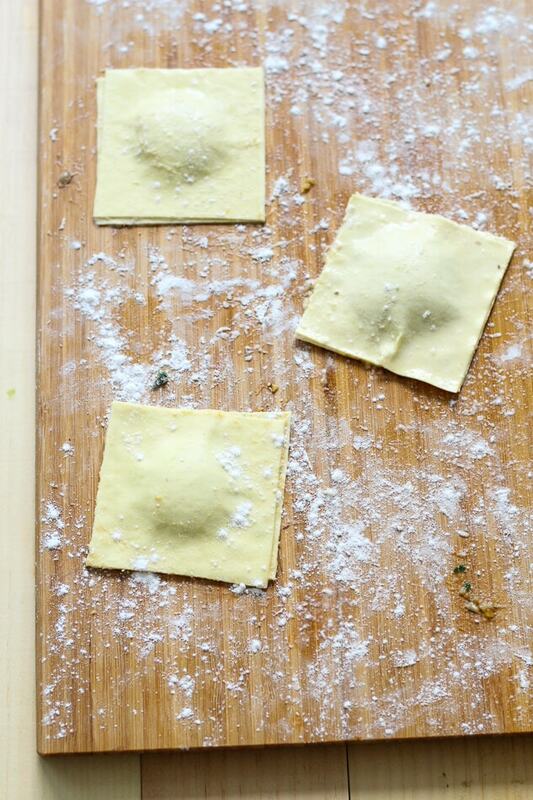 Raviolis also freeze well! Heat olive oil in pan and once hot, add garlic and butter. Once butter is melted, add cream, milk and flour, whisking in cheese slowly. Add salt and pepper, and then simmer sauce for 4-5 min on low. Add red peppers, then mix together in a blender or Magic Bullet to puree the red pepper and create a smooth, creamy sauce. Set aside. What a pretty pasta! I never thought to use fresh lasagne noodles for ravioli–I’ve tried won ton wrappers, but this looks even better. As I’ve got plenty of farm share squash, I’d go for the filling! I did not make the ravioli, but I did make the Red Pepper Cream Sauce. I had a 16 oz jar of roasted red peppers so I used them instead of roasting fresh bell peppers. I drained the jar and ran the peppers through my food processor before adding to the sauce. The sauce was great and so quick and easy! So glad to hear that!!! This sauce is one of my favourites for sure – and what a great shortcut, using jarred roasted red peppers! I’ll have to try that!